Celebrate the history of a beloved American brand that has become familiar to generations of farming families. Follow this iconic agricultural company from the early 1800s, when John Deere himself devised a plow blade in his blacksmith shop, through the automation of the two-cylinder tractor nearly 100 years later, and into the 21st century of advanced technology and the future of farming equipment. 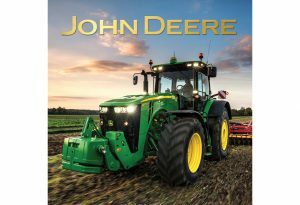 Along with information about the company’s history and milestones, learn about its most famous products, its tractors. Profiles of classic and modern tractors chronicle the history of America’s most famous and glorious workhorses. From the quaint little “Johnny Poppers” of the company’s early years to the New Generation tractors to the highly sophisticated thousand series of today. John Deere covers these soldiers of the soil with statistics and images. 4-color photography, including photos of John Deere memorabilia from throughout the decades.